Well folks, the eclipse is over and done, and some of the crowds are heading back home. Thank you to everyone who joined us in the Winds for such an excellent celestial event-the eclipse was stunning, and with the Wind River Range as a backdrop, it made for a memorable experience for many. The Winds are experiencing “normal” late August weather patterns and temperatures. Expect highs in the low 70s during the day and nighttime temps in the mid- to upper 20s at night. We have had our first snow in the high country, so travelers should use good sense when packing and plan for inclement weather turning to snow or ice up high. Warm layers, rain gear, a hat and some gloves should be in everyone’s pack. Thanks to our tremendous winter season and the delayed start this year, we still have wildflowers in the backcountry, which is quite a treat around here. Given our chilly nights, I do feel their days are numbered however, so enjoy them while you still can! The mosquitoes are mostly gone as well, although there are still some pockets of them within the lower elevation areas holding a lot of water. While you can pass on the headnet, I’d still recommend a small bottle of bug spray just in case. The entirety of the Bridger-Teton National Forest was under a fire ban for the past week, but that has just been lifted. Standard backcountry fire regulations apply-ask if you are unsure about the rules and please (!) take care of our beautiful area and protect others in the backcountry by ensuring any campfires are completely out and no longer smoldering or smoking before leaving your site or turning in for the night. Given the enormity of our lingering winter, there are many places in the Winds still holding snow. Most of these areas include high passes and predominately north-facing aspects that don’t get much sunlight. Here’s a quick hit list of some of the more sought-after areas. As always, if you need more information or wish to know the conditions of an area not listed here, please get in touch anytime. Regarding some of these high alpine passes, and depending on your comfort level traveling up or down a steep snow slope, you may wish to consider traction aids such as Microspikes, and/or an ice axe for self-arresting. Knapsack Col: Snow on the east side of the pass leading into Titcomb Basin. This is the steeper side of Knapsack Col. 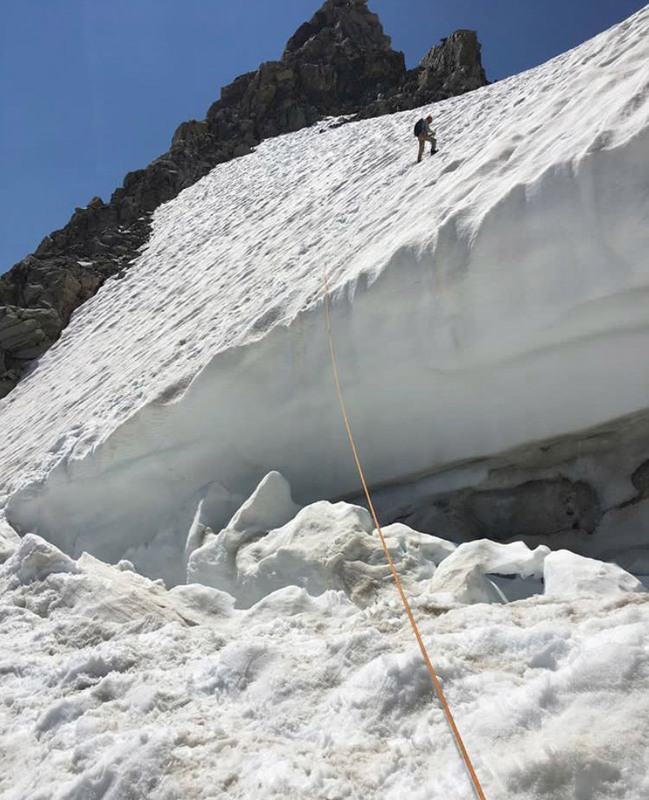 The 12-foot cornice is gone and folks have been navigating up and over (from either side) for about three weeks at this point. Gannett Peak: Expect partial snow coverage up and over Bonney Pass. There are no exposed crevasses on Dinwoody Glacier. The snow bridge is still over the bergschrund. While the bergschrund is still covered on the left, it is exposed on the right, so be aware of your location as you ascend toward the summit. Ice axes and crampons are mandatory. HUGE Thank you to Instagram followers @alanpbernier and @dmarshallphoto for sharing this photo from their successful summit of Gannett Peak. Fremont Peak: Expect some snow covereage in Indian Basin, but the peak is clear. Indian Pass/Knifepoint Glacier: Snow coverage on the east side of the Continental Divide. Traction aids are recommended. Hay Pass: Hay Pass is still holding snow on the east side of the divide. Hailey Pass: About 200 feet of mandatory snow travel on the east side (steeper side) of the divide. Washakie Pass: Given its more gradual slope on either side of the Continental Divide the snow is less of a concern on this pass. Texas Pass: This is not a USFS maintained pass, although it sees frequent use. Ascending and descending boulder fields can expose loose rock, so be aware of the conditions around you and maintain safe distances if you are traveling as part of a group. Expect some snow near the crest of the pass. Cirque of the Towers: You should see some vestiges of snow lingering within the Cirque but nothing prohibitive with regard to hiking or climbing. Afternoon thundershowers can be expected to move in surrounding the lunch hour. Weather can change in an instant in the Winds-plan accordingly and be off any high points before the storms move in. Remember that the entire Wind River Range is Grizzly country, and is home to vast amounts of other wildlife as well. There is a food order in place requiring each visitor to the Wind River Range protect their food from animals. Please keep our wildlife and yourselves safe by keeping a clean camp and diligently taking care of your food, waste, and garbage. It is your duty as a visitor here to tread lightly-please respect the Winds and keep them free, wild, and clean. Please feel free to reach out with any questions you may have-we are happy to help in any way to ensure you have the best adventure possible.